Already in 2013, the Swiss National Bank (SNB) spoke out against the gold initiative and revealed that the Swiss gold is stored mostly in Switzerland and 20% in the UK and 10% in Canada. There is no Swiss gold in the United States according to SNB chairman Jordan. In this post we provide an exchange of Jordan’s arguments against the ones of the gold initiative. We also state our view that is not as strict as the one of the referendum proponents. The gold of the Swiss National Bank must be stored physically in Switzerland. Sell half of its fiat money reserves. Jordan: In my following remarks, I would like to speak about the subject of gold as part of the SNB’s currency reserves. As reported in the media last week, the so-called gold initiative has formally qualified for a referendum vote to be held. This popular initiative demands that the SNB hold at least 20% of its assets in gold, that it be prohibited from selling its gold reserves and that all gold reserves be physically stored in Switzerland itself. The SNB does not generally comment on any political initiatives. However, the gold initiative has a very direct impact on the SNB’s capacity to act. This is why we are taking the opportunity today to present our viewpoint for the first time on the demands of the initiative. The initiators see a high level of gold reserves as a guarantee for currency stability. They fear that the Swiss franc will decline in value and that price stability will be threatened if a large proportion of the balance sheet does not consist of gold holdings. They are also concerned that the SNB’s gold reserves held abroad are not secure and will not be accessible in critical situations. We share the objectives the initiators put forward, such as maintaining currency and price stability and ensuring both the SNB’s capacity to act and its independence. However, the measures proposed to this effect are not suitable; in fact, they are even counterproductive. Instead, they are based on misunderstandings about the importance of gold in monetary policy and would compromise the SNB’s capacity to act in pursuing its monetary policy, which would run counter to the objectives envisaged. In other words, these measures would, in certain situations, considerably hinder the SNB in fulfilling its monetary policy mandate and be detrimental to Switzerland. We therefore consider it our duty to point out the serious disadvantages of the initiative already at an early stage. Having said that, however, the SNB is interested in a dialogue on any questions connected with the initiative. With this in mind, allow me to make a few remarks. The SNB has the statutory mandate to ensure price stability, while taking due account of economic developments. The monetary policy operations that must be carried out in fulfillment of this mandate have a direct impact on the SNB’s balance sheet. In order for the SNB to fulfill its mandate at all times, its capacity to act in monetary policy matters must not be compromised by rigid rules on the composition of its balance sheet, which would be the case with the required 20% minimum share of gold and the ban on the sale of gold. It was precisely the latest crisis that demonstrated how important it is for the SNB to have the flexibility to expand its balance sheet, if needed. In future, the SNB will also need this flexibility to reduce the balance sheet again, if necessary. Our opinion: The SNB reduced its balance sheet with the SNB gold sales until the year 2007, when the gold price was weak. In 2007 the euro hovered around 1.60 CHF. At the time there were discussions if the currency reserves were still needed. But the decision was to keep the “fiat currencies”, even if the franc was undervalued. The expansion of its balance sheet from 2008 on was done only with fiat. In 2010 the SNB obtained a big loss on these currencies while the gold price continued to rise. Jordan: The demands of the initiative would considerably curtail this flexibility. Were the initiative to be accepted, the SNB would in the current environment have to make large scale gold purchases to meet the required 20% minimum share of gold. It would not be allowed to sell this gold at a later point, even if it had to reduce its balance sheet again in order to maintain price stability. It would also hamper our possibility to maintain the EUR/CHF floor and avoid deflation. Our comment: The proponents of the initiative suggest to sell the recently acquired fiat currencies and realize the profits obtained with the strengthened dollar and with euros. SNB’s balance sheet really exploded in August 2011. At that time, the central bank bought euros between 1.00 CHF and 1.10 CHF and dollars under 0.80 CHF. This realization of profit would reduce the balance sheet, but possibly would send the euro to 1.10 CHF. But it would help to maintain obtain price stability. As opposed to the SNB, they judge that slight deflation caused by technological improvements or lower oil prices is beneficiary and also implies price stability. The latest data from Swiss statistics show that food is up 0.8% YoY, clothes 0.9%, shelter and housing energy 0.9%, education 0.7%, restaurant and hotels 0.6%. Only technology, imported durable goods and falling oil and energy prices in the other categories of the CPI exercise deflationary pressure. In total the Swiss CPI was unchanged against last year. The demand that the gold reserves cannot be sold are effectively very restrictive and should be over-thought. We judge that a minimum of 10% gold and a target value of 20% over the longer term should be achieved. It should be possible to buy up to 5% in the form of gold ETFs. The Swiss franc, similarly as gold, acts as safe proxy to strong Chinese and global expansion, avoiding the risks of holding Chinese assets. The reason are the strong exports of Switzerland and the closely related German economy to China. Jordan: In a worst case scenario, the assets side of the SNB’s balance sheet would, over time, be largely comprised of unsellable gold. Managing the interest rate level and the money supply would only be possible via the liabilities side of the balance sheet; in practice by issuing the SNB’s own interest bearing debt certificates (SNB Bills). This would have serious financial consequences: On the assets side, the SNB would neither have any interest income nor could it realise any profits on gold due to the ban on sales. On the liabilities side, it might have to pay high interest on debt certificates. The SNB could therefore find itself in a situation in which it could only finance its current expenses by means of money creation. Our opinion: This argument seems to be flawed: If the interest rate of SNB bills rises then we are typically in an inflationary scenario, in which also the gold price increases. With falling inflation both interest on (newly issued) bills and the gold price would fall. The only exception would be a considerable deterioration of the Swiss economy, in which Swiss inflation is far higher than US inflation. We remember well the 1990s when this happened. The phase of higher Swiss inflation ended in a real estate bust, favorited by late SNB rate hikes. The SNB is paving the path now for a similar situation with its expansive monetary policy. The central bank risks to be too late once again with rate hikes. Jordan: The far reaching demands of the gold initiative would inevitably have repercussions for our monetary policy. In making its monetary policy decisions, the SNB would have to consider the long-term consequences the necessary gold purchases would have on its capacity to act and on the structure of its balance sheet. Furthermore, market participants would hardly regard monetary policy decisions as credible, should these decisions involve a substantial expansion of the balance sheet, which in turn would impair the effect of monetary policy. It is unlikely that decisions such as the introduction of the minimum exchange rate or the stabilisation of UBS would have been made in the same way given these circumstances. Our opinion: During the crisis in Summer 2011, risk aversion and Fed’s monetary expansion drove the gold price to nearly 2000 US$. The gold-related Swiss franc overshot to EUR/CHF of 1.00. The SNB has correctly seen this overvaluation of the franc. As measure the SNB introduced the minimum exchange rate of 1.20. For us this 1.20 was too high. The choice of 1.10 EUR/CHF would have reduced considerably the SNB balance sheet, because the Swiss franc safe-haven would have been more expensive for foreigners. Hence the expansion of the monetary base might have been only half as big. This excessive money might lead to mis-allocation of resources, to a boom and finally to a bust of the Swiss real estate boom. The question remains how long this process of boom expansion takes. The SNB should question itself about its credibility, in particular during the failed interventions in 2009 and 2010 , but also as for the definition of the EUR floor level. Instead of buying fiat currencies in huge quantities and financing it with newly printed Swiss franc, the SNB should have been able to sell some gold reserves exactly in that moment, for example in the form of ETFs. However, since it sold so much gold earlier (for far cheaper prices), this did not make sense. According to Q2/2014 data, the SNB holds 8% of its assets in gold. Jordan: This constraint on the capacity to act would not be in Switzerland’s interest. Gold is nevertheless an important component of the SNB’s assets. However, this is not because gold guarantees price stability. In today’s monetary system, there is no direct connection between the proportion of gold on the SNB’s balance sheet and price stability. This is also evidenced by the fact that the objective of price stability has been better achieved. In recent years, even though the proportion of gold on our balance sheet was smaller, than at times when gold accounted for a much larger share. A high proportion of gold on the balance sheet is no guarantee for price stability. There is another reason why gold is useful for the SNB and Switzerland. As part of a good diversification of currency reserves, a certain proportion of gold can help reduce the balance sheet risk. We have therefore never ruled out the possibility of future gold purchases. Our opinion: Effectively the (at the time) 15% gold share in 2010 reduced SNB losses for the year 2010 considerably. Gold has two functions for the Swiss and its central bank: It protects against inflation and helps to reduce balance sheet risks, because the Swiss franc is correlated with gold. We think that the SNB will effectively buy gold again, when (or if !) the gold price falls to levels of 700 or 800$. Even if the SNB doubles its quantity of gold holdings with purchases at this lower price, it will be insufficient to raise the gold share to 20%. 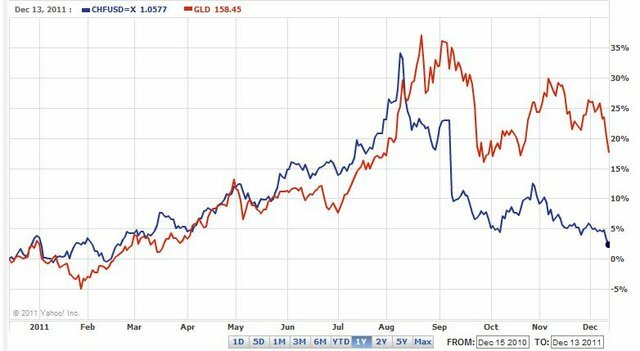 Jordan: At the same time, however, gold is also one of the most volatile and thus riskiest investments. A high proportion of gold would increase the SNB’s balance sheet risk. With the increasing share of gold on the balance sheet, a secondary effect would be that the profit distribution to the Confederation and the cantons would likely be lower. This is because, unlike foreign currency investments, gold does not generate income in the form of interest or dividends, and any valuation gains on gold could not be realised because of the ban on sales. Our opinion: The recent years have shown that gold is very volatile. The reason is again the Fed. When they decided to reverse course in June 2013, Emerging markets did not have the cheap money and credit from the U.S. any more. Instead central banks in Emerging Markets kept money tight, which increased costs for businesses, lending became expensive. Finally those higher rates slowed them significantly which hindered their previous wage and spending expansion. 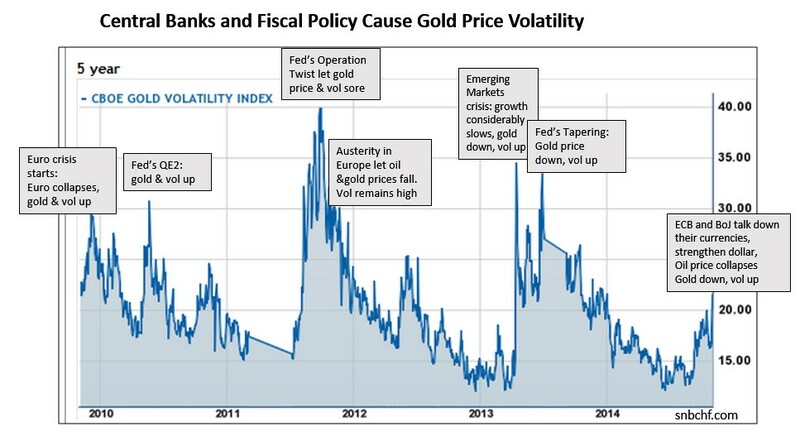 The following graph shows how central banks and fiscal policy cause gold price movements. As long as the Chinese Renmimbi is not fully convertible and dominated by an authoritarian regime and as long as US treasuries deliver negative real interest rates, gold is re-established as reserve currency for many central banks in emerging markets. Since mid 2013, however, five to ten year US treasuries achieved positive real interest again; and logically gold weakened. 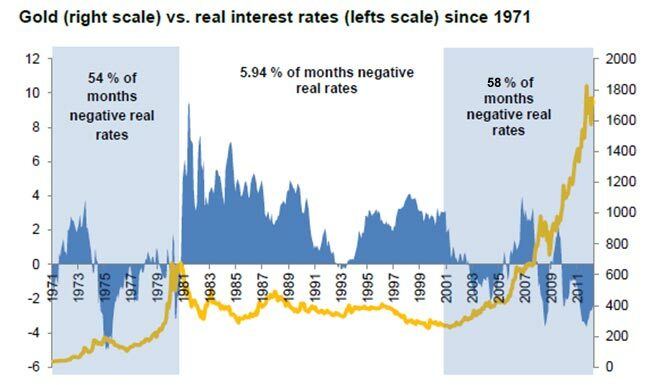 The argument that gold generates no income has to be put into perspective with the historically proven fact that gold appreciates in periods of negative real rates and financial repression. Once again we agree with Jordan, that the total ban of gold sales is counter-productive. Swiss bonds: 100 francs would have become nominal 4300 Fr. and real Fr. 700 Fr. Central banks do not buy long-term bonds, but rather shorter term papers (maturities up to 3 or 4 years). Hence the comparison with bonds, as done above, is difficult. Central banks are an anchor of stability, in particular during recessions. Therefore the equity share should not be too high. Some, like Swiss people’s party politician Kaufmann argue that the SNB should build a state-owned investment funds. But the Norwegian state fund that actively buys stocks, is able to increase systemic risks for Norway when both oil and stock markets collapse. The SNB buys foreign bonds and stocks, but nearly no Swiss assets at all. Most foreign assets are denominated in dollars or euros. Currency depreciation effects may overlay gains on foreign bond and stocks. One example were the 1970s when the dollar and the “euro components” Lira, Peseta and Drachma, collapsed. But first gold, then the Swiss franc and then the German Mark prevailed – exactly in this order. The proponents now argue that due to high public debt, the current period of positive real interest on bonds (e.g. on 5 year US Treasuries) will be very short. Real interest rates on bank deposits are still negative. Similarly as the Bank of Japan, the Fed and the ECB and the governments behind them have an interest to maintain rates low and inflation high, on financial repression. This finally leads to currency depreciation as we currently witness with the yen. The BoJ replaced the Fed in the biggest financial repression, the potential next one is the ECB. Both Japan and European economies are positively correlated to gold, i.e. when those currencies are weak then gold is also weak. NZZ implicitly claims that we will live again in a long period of positive real interest rates as we did in most periods since 1926. But we all know that past performance is no guarantee for future performance. This also applies to real interest rates. Real interest rates on deposits in Emerging Markets, however, have become positive with Fed’s tapering. This implies that people there currently have “less appetite” on gold.